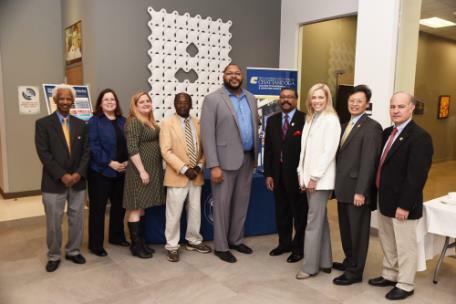 Shown from left to right are Dr. Ahmed Eltom, UTC; Beth Ruta and Lyn Potter, Chattanooga State; Dr. Joseph Kizza, UTC; Dr. Tremaine Powell, Chattanooga State; Dr. Richard Brown, UTC; Dr. Rebecca Ashford, Chattanooga State; Dr. Daniel Pack and Dr. Ahad Nasab, UTC. 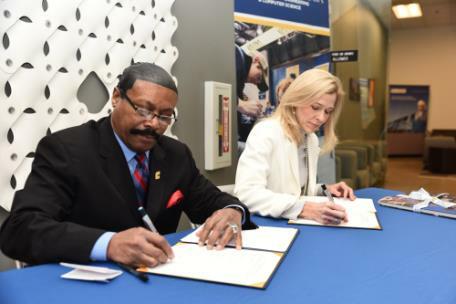 Chattanooga State’s Dean of Engineering & Information Technologies, Dr. Tremaine Powell and UTC’s Dean of Engineering, Dr. Daniel Pack, said that although the agreement had been accepted for a couple of years, today’s signing made it official. Beginning Tuesday, every engineering technology degree within the division will allow a student to transfer seamlessly to UTC as a junior. “Chattanooga State and The University of Tennessee at Chattanooga have a strong partnership, and this articulation agreement is a product of that. This agreement will allow our students completing AAS degrees in Engineering Technology to transfer to UTC and major in Engineering, Engineering Management, or Mechatronics. These AAS degrees usually lead directly to employment and are not designed to transfer. But, this agreement will allow them to transfer to UTC, opening up new opportunities for our students,” said Chattanooga State President Dr. Rebecca Ashford. Chattanooga State’s engineering technology students may consult advisors within their program of study to learn more about this opportunity. Visit www.chattanoogastate.edu/engineering-information-technologies or call 423 697-4434 for information.